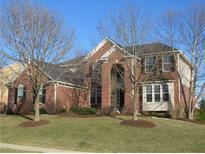 Below you can view all the homes for sale in the Long Branch Estates subdivision located in Zionsville Indiana. Listings in Long Branch Estates are updated daily from data we receive from the Indianapolis multiple listing service. To learn more about any of these homes or to receive custom notifications when a new property is listed for sale in Long Branch Estates, give us a call at 317-987-2530.
large 2 story entry~Hardwoods on entire main floor~Lots of daylight~Great kitchen with center isle, double ovens & large walk in pantry~Many custom built ins~Main level den with custom bookcases~Split staircase~Oversized master bedroom~Updated master bath~Huge basement with tons of daylight, custom built wet bar, full bath & bedroom~ Plenty of storage. MLS#21629132. F.C. Tucker Company.